Nicholas Caamano screens the goalie in the preseason game last weekend. This is not the same team that took Toronto to seven games in the Finals last season. It never is in the AHL. Success, especially deep in the playoffs, brings new opportunity for players and coaches alike. Texas starts the season with a crop of fresh faces, many long in gestation as Dallas draft picks. 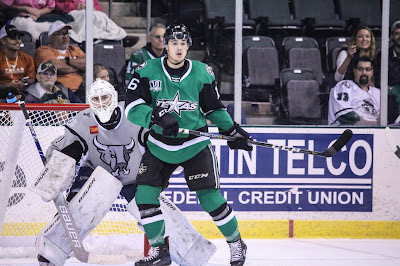 Captain Curtis McKenzie, forward Brian Flynn, defensemen Andrew Bodnarchuk and Brent Regner and goaltender Mike McKenna all moved on after the Finals were over, and Texas seeks to replace them with a new crop of veterans and rookies alike. Even the coaching staff has shifted as Karl Taylor now leads the Milwaukee Admirals bench with Greg Rallo as his assistant. 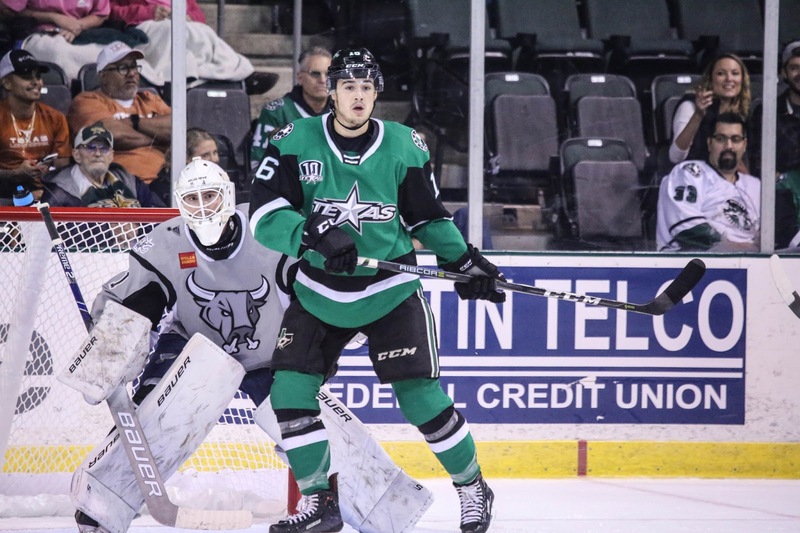 New additions at forward include Nicholas Caamano and Adam Mascherin, two Dallas draft picks with big expectations, and Erik Condra and Michael Mersch, wily veterans with lengthy experience. After losing Regner and Bodnarchuk on defense, Texas is a young crew on the backend. John Nyberg, Ben Gleason and others will anchor their defense around veterans like Joel Hanley, Reece Scarlett and even the still relatively young Dillon Heatherington. The biggest question on the squad right now is in goal. Early in the summer, it looked like Dallas would sign another journeyman to pair up with Landon Bow, similar to last year. The Mike McKenna signing worked so well it wouldn’t have been surprising if he was the man again. However, the surprise of Colton Point coming out of college early tipped those plans upside down. Now, Point will compete for starts with Bow, who is most likely to make it over Philippe Desrosiers. The question of who gets the starts is open. Coach Laxdal has always shown a willingness to go with the hot hand, regardless of whatever the draft status or pedigree is of a player in net. Landon Bow, a native of Alberta, moved to Toronto for the summer to work on his quickness and strength with the famed trainer Gary Roberts. It figures to be a fierce competition and could be the key to Texas’s success this season. With the departure of Curtis McKenzie, the Stars will have three alternate captains for a few weeks before deciding on a captain for the season. Laxdal puts a lot of trust in his leadership group and it’s going to be important with all of these younger players on the roster.